We’d love your help. Let us know what’s wrong with this preview of Little Gods by Jenny Ackland. To ask other readers questions about Little Gods, please sign up. I am very happy giving Little Gods four stars for the beautiful way the author writes about growing up in Australia in simpler times, before the advent of iPads, computers and smartphones. Olive and her friends enjoy a level of freedom unknown by today's children but which I remember from my own childhood. I enjoyed the story of Olive's growing up very much although I did not much like Olive herself. When Peter tells her she never listens I can agree with him totally and why he kept coming back f I am very happy giving Little Gods four stars for the beautiful way the author writes about growing up in Australia in simpler times, before the advent of iPads, computers and smartphones. Olive and her friends enjoy a level of freedom unknown by today's children but which I remember from my own childhood. I enjoyed the story of Olive's growing up very much although I did not much like Olive herself. When Peter tells her she never listens I can agree with him totally and why he kept coming back for more when she bossed and bullied him around I do not know! The book is full of dysfunctional characters but all of them are fascinating which makes the book hard to put down. Little Gods is a story of a regular family. Three sisters so very different, yet bonded by blood. Thistle- the philosopher, she believes in speaking up and speaking the truth. Audra- quiet, invisible, almost ghost like very rarely seen or heard. Rue- a catastrophizing mother who believes children should be protected from life and kept away from harsh realities. They are close but also annoy each other deeply. They don’t have deep and meaningful conversations. They bottle up their emotions just l Little Gods is a story of a regular family. Three sisters so very different, yet bonded by blood. Thistle- the philosopher, she believes in speaking up and speaking the truth. Audra- quiet, invisible, almost ghost like very rarely seen or heard. Rue- a catastrophizing mother who believes children should be protected from life and kept away from harsh realities. They are close but also annoy each other deeply. They don’t have deep and meaningful conversations. They bottle up their emotions just like any ordinary family. What struck me is the realness of the characters. This story is not escapism; it’s a stark look at reality. Part literary fiction, part coming-of-age, Ackland’s writing is lyrical and original. A touching story that raises the question of how much or how little should we tell our children. Does withholding a truth really protect them? Narrated by 12 year old tomboy Olive, she knows how to manipulate her peers. She’s not scared of anything especially the Sands boys. She likes to ask questions to know the how and whys of the world. When someone mentions she once had a sister she is determined to find out the truth even if it means listening in to conversations and piecing together snippets of information to formulate her own truths. If you grew up during the 70’s or 80’s Little Gods is a nostalgic trip through childhood from going to the local pool to buying a razz and riding your bike through the local bush, Little Gods is authentically Australian. Little Gods is a heartfelt coming-of-age featuring a young girl who is wilful, fanciful and brave and through her Ackland has captured the essence of 1980’s Australia. With thanks to Allen & Unwin for my uncorrected proof copy. The family’s frequent visits to the farm where Olive’s two aunts and an uncle lived brought her in contact with her cousins. And as with all children in the Australian bush, Olive and her cousins enjoyed swimming in the dam, exploring and generally getting up to mischief – while Olive kept her ears open as she grew toward teenager-hood. Her constant companion was Grace, the bird Olive had rescued as a chick. Would Olive’s search for the truth free the turmoil of her mind? Or would it hurt much more than she could stand? Set in the Mallee scrub of country Victoria, Little Gods by Aussie author Jenny Ackland is told through the eyes of Olive, a complex, outwardly-tough young girl, determined to find answers. The complication of Olive’s family, with Thistle, who was an entirely unconventional woman; Rue, continually worried about what others thought; and secrets past to muddy the waters – she was a confused girl fighting an uphill battle. A poignant and intriguing novel, Little Gods is worth the read. Recommended. A young girl searching to uncover buried secrets that her close extended family seem intent to keep from Olive. The more these adults refuse to shed light on what happened to Olive’s dead sister the more she wants answers, so much of this book is Olive trying to dig around to seek pieces of the puzzle, Olive becomes fixated on getting some answers delving into some dark waters. The setting sums up small town summers in Australia where imaginations can run wild this being the case for Olive and he A young girl searching to uncover buried secrets that her close extended family seem intent to keep from Olive. The more these adults refuse to shed light on what happened to Olive’s dead sister the more she wants answers, so much of this book is Olive trying to dig around to seek pieces of the puzzle, Olive becomes fixated on getting some answers delving into some dark waters. Being an only child, Olive Lovelock didn't get along with other children at school and she didn't much care for the teachers either. Olive had just one friend, Peter. After school they would hang out together riding their bicycles to the local swimming pool. Olive believed listening to other people talk was a way of learning things, but there are some things you shouldn't listen to as Olive soon found out. When Olive finds out about something that went on in her family she's not convinced about Being an only child, Olive Lovelock didn't get along with other children at school and she didn't much care for the teachers either. Olive had just one friend, Peter. After school they would hang out together riding their bicycles to the local swimming pool. Olive believed listening to other people talk was a way of learning things, but there are some things you shouldn't listen to as Olive soon found out. When Olive finds out about something that went on in her family she's not convinced about how it happened. She has her thoughts on it, but proving she is right could take time and turn out to be quite a challenge as she is faced with more family secrets. This story is set in the Malley religion in country Victoria. A compelling tale of family secrets and a young girl who is insistent on finding out the truth. Little Gods by Aussie author Jenny Ackland was a really entertaining read. Recommended. With thanks to Allen & Unwin for my uncorrected proof copy to read and review. There is definitely shades of ‘the great Australian novel’ within this latest offering by Jenny Ackland, and while I’m usually reluctant to draw comparisons between stories, I felt a certain Stand By Me vibe about Little Gods, that whole ‘the summer before everything changed’ sort of feeling. I really think this is a story that will play out well on the big screen, it has all the qualities essential for a timeless Aussie movie. Fingers crossed for Jenny! In Olive, Jenny has created one tough litt There is definitely shades of ‘the great Australian novel’ within this latest offering by Jenny Ackland, and while I’m usually reluctant to draw comparisons between stories, I felt a certain Stand By Me vibe about Little Gods, that whole ‘the summer before everything changed’ sort of feeling. I really think this is a story that will play out well on the big screen, it has all the qualities essential for a timeless Aussie movie. Fingers crossed for Jenny! In Olive, Jenny has created one tough little cookie. Smart, fearless, and highly imaginative, Olive is the sort of girl who makes other girls nervous, and consequently, she spends all of her time with boys, and even they have to rein her in sometimes. It was nice to at last get an Australian coming of age story with a girl front and centre; any others that spring to mind have all been about boys. But Olive’s boldness proves to be her undoing and I keenly felt that Jenny applied an expert hand to Olive in the way only a woman could. Little Gods is very much a character driven story. It meanders along with Olive as the main narrator – in fact, there are only a few instances where this changes within pivotal scenes – and much of the story is concerned with the daily comings and goings of a twelve year old girl. There were times when this proved to be incredibly insightful, particularly when you were able to read between the lines of Olive’s observations and also whenever she was eavesdropping on the adults or in conversation with her aunt Thistle or uncle Cleg, two adults who had no sense of child-sensoring – for different reasons though. But there were other times when I tired of Olive. It’s a reasonably long novel and some of the time, not very much seemed to be happening. Child perspectives within novels for adults can be tricky to maintain, particularly within a story that is not especially plot driven, and consequently, my attention wandered quite often while reading Little Gods. While we see the story through Olive’s eyes, everything revolves around her family. The Lovelock family reminded me a little of my own, all involved with each other, cousins growing up side by side, secrets swept under the doormat and mental illness managed in-house; your typical Australian family from the 1980s. The nostalgia is rich throughout Little Gods and that carried me through. Who doesn’t like to look back on the ‘good old days’, although we usually have selective memory when it comes to looking back, because I can tell you now, those old days weren’t all good all the time, far from it. But when I tell my children about my own childhood, it’s the good days that rise to the fore, and I really feel that Jenny tapped into this tendency, that selective memory we as adults tend to practice when it comes to talking about our childhoods, especially when we’re trying to get our children up off the couch and out into the fresh air. Life was different back then though, there was a freedom to my childhood that is absent from my own children’s. I was a farm kid too, so my days were spent away from the house getting into all sorts of things I probably shouldn’t have with no adults aware of my whereabouts ever. Much like Olive. The secret Olive unearths was a preventable accident born out of a lack of supervision on the part of the adults in Olive’s life. Yet this was common. I had friends with missing fingers and toes from preventable accidents and yes, missing siblings too, who had been run over or drowned. This was not unusual. Now, we watch our children constantly and rush them to the emergency room for every fall they have. Is this better? I don’t know. What I do know, is that I’m not convinced my children are as self-sufficient as my cousins and I were. Some days I doubt they could cross the street without a near miss! Little Gods is a slice of life from days gone by and I loved the authenticity of it. It’s about family, the good and the bad, loyalty and protection within, even when we don’t like the people we’re related to. It’s about understanding that the truth can hurt and won’t necessarily set you free. Beautiful, character-driven storytelling. Just loved it. Get amongst it. 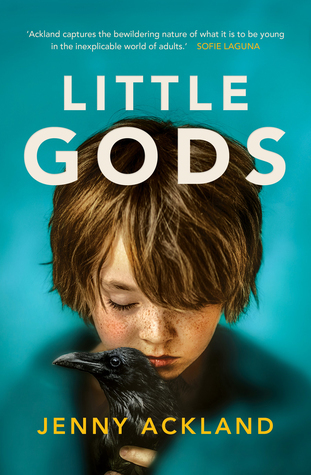 Little Gods is the second novel by Australian teacher and author, Jenny Ackland. Olive Lovelock has just turned twelve and is looking forward to the summer break spent with her cousins on their farm, Serpentine. But a chance remark by one of the Sands brothers at the local pool gives her a mystery to solve. Did she once have a baby sister? What happened to her? Why does no-one talk about her? While the bones of the mystery will be apparent to the astute reader early on, the finer points of the Lovelock family’s tragic events are fed to the reader gradually and attention to seemingly insignificant details is required for it to all fall into place. And it eventually becomes clear that Olive’s memories are not quite as reliable as they first seem. Olive is clever and wilful and, under the influence of her unconventional Aunt Thistle, daring, confident and determined. Craving Olive’s approval, her best friend, Peter and her cousins, Sebastian and Archie join in with her audacious plans, often against their better judgement. But helping her to extract a confession and mete out justice to the person she believes responsible for the tragedy, is that a step too far? Ackland’s descriptions of the summer holidays (days at the pool, riding bikes, climbing trees, midnight excursions, pet wild birds, family stories retold, secret languages, inventive games) are so evocative that Australian readers of a certain vintage will wonder how she has managed to download their personal childhood memories without their knowledge. Ackland gives the reader some marvellous descriptive prose: “Olive felt the pull of the trees. How would it be to float out of the window up over the roof and away from earth? To be far from the hard emotions that ran underneath the dinner noises?” and “A proper memory arrived then, like mail through a slot.” and “Thoughts would tap at her in a random series of small images that dropped into her head, without cause.” are examples. Ackland’s second novel is a story about growing up and memories, about families and things not talked about in them, a story that is funny and sad and moving, and will stay with the reader well after the last page is turned. With thanks to Allen and Unwin for this Uncorrected Proof copy to read and review. Incredibly beautiful, breathtaking novel that centers around an adorable little girl who left her mark on me. Little Gods is set in the late 70’s/early 80’s, in the country town of Mallee, Victoria. The heart of the story is 12 year old Olive Lovelock with a wilfully strong personality, and an inquisitive mind. She has a bad habit of ears dropping into adult conversations - but can miss interpret what they say or do - and loves digging around places where she not allowed to be. If you’re an adul Incredibly beautiful, breathtaking novel that centers around an adorable little girl who left her mark on me. Little Gods is set in the late 70’s/early 80’s, in the country town of Mallee, Victoria. The heart of the story is 12 year old Olive Lovelock with a wilfully strong personality, and an inquisitive mind. She has a bad habit of ears dropping into adult conversations - but can miss interpret what they say or do - and loves digging around places where she not allowed to be. If you’re an adult are trying keep a family secret hidden or quiet, Olive is probably not the best person to have hanging around. She probes and probes, and she asks too many questions until it becomes too much! And this is where the problem begins. Olive discovers something about herself and her families past where she’s determined to find answers, but deep down she’s not really ready for the truth. This is not only about Olive’s quest to uncovering family secrets, it’s also a story about issue associated with growing up. Olive is at that tricky ‘in-between age’, where she’s not exactly an adult but no longer a child; she still craves for a child’s hugs and affection but will not ask. She said ‘she wish she was a girl again’ where she didn’t have a worry about adult stuff or problems at school but to only master cartwheels on the lawn – and I wished that for her too. I developed a really strong connection to Olive like she was my own child. Seeing her being rejected by teachers, treated unkindly by her classmates, and trying to deal with grief and loss over the death of a loved one or pet was heartbreaking – If I could pluck her out of the book to ease her pain, I would have. Little Gods is a beautifully written coming of age novel. Distinctive Australian and - if you’re about my age – will evoke feelings of your youth. I urge you to read it. I am always grateful to receive an advance copy, or in this case an uncorrected proof, of a novel from the publisher in return for an honest review. So thank you to Allen & Unwin for my copy, although I regret that my review will not be very favourable. I started this book several weeks ago, but put it aside after about 80 pages because I was not enthused. I took the book away on holidays, thinking that a leisurely environment might afford me a better entry to the story. I’ll confess that I o I am always grateful to receive an advance copy, or in this case an uncorrected proof, of a novel from the publisher in return for an honest review. So thank you to Allen & Unwin for my copy, although I regret that my review will not be very favourable. I started this book several weeks ago, but put it aside after about 80 pages because I was not enthused. I took the book away on holidays, thinking that a leisurely environment might afford me a better entry to the story. I’ll confess that I only finished the book in order to honour the agreement with the publishing company to write a review. Perhaps there is something wrong in my head, as I see so many 4 and 5 star ratings on Goodreads for a book that I really, seriously did not like. There was not one main character in the book that I could engage with. The two principal characters, Olive Lovelock and her aunt Thistle Nash, annoyed me intensely. I’ll set out the aspects of the book that I found positive. I appreciated the poignancy of Olive’s situation, that she was isolated, shunned by classmates, teachers and adults generally. When the reasons for that cruel ostracisation became clear at the end of the book I was touched by the sadness, and heartened by Olive’s resilience. Similarly, as Thistle’s tragic story came to light, I felt more comfortable that her eccentricities had a basis in a harsh past, and were not just affectations. What happened to her back then was typical of social practices and attitudes at that time, things that we find truly appalling today. I enjoyed some of the minor characters, like Olive’s nerdy friend Peter, and her odd uncle, crusading lawyer, Clegworth Lovelock. But I really could not warm to Olive at all. The girl was undeniably precocious, but she did not strike me as particularly bright. Rather, she was conceited, convinced of her own superior ideas and thoroughly lacking in emotional intelligence. Lonely, suffering badly from parental indifference, her behaviours and utterances alienated her from potential allies and friends. OK, Ms Ackland, I get it!! But why, oh why do you have to keep cramming Olive’s head with so many words and ideas and attitudes? It became a struggle for this reader to slog all the way through the verbiage. My dislike of the book stems not from its ideas, which are sound and relevant, but from its writing style and plot development. This book probes deeply into the workings of a dysfunctional family. The author focuses on minute details of mundane domestic life, to an excessive extent in my opinion. The narrative threads are drowned in a flood of words. We are subjected to large slabs of 12 yo Olive’s strident inner voice, while the women of the family make cryptic remarks over endless cups of tea. I found this surfeit of banality to be mind-numbingly boring. Another thing that really bugged me was the unevenness of the pitch. On many occasions I was confounded by Olive’s contrariness. Did the author want me to empathise with this character or what? At some points the story took a mildly comedic turn, so I thought I might be reading a satire, but in other chapters the tone turned dark and somewhat Gothic - I wished the author would make up her mind! At its core the book contains some genuinely poignant passages, which reflect prevailing social issues and personal pain. As these factors came to light, my understanding of the characters’ flaws increased and grew into some sort of compassion. It was a great shame that this reader had first to endure thousands and thousands of excessive words, most told in the voice of a thoroughly obnoxious child. A Goodreads rating of 2 stars equates to “It was OK”, and that sums up my feelings about a book that I did not really enjoy reading. "As a child, trapped in the savage act of growing up, Olive had sensed she was at the middle of something." Olive's story of finding who she is at twelve, as her childhood slips away, broke me over and over. A baby's death reverberates down the years, and is interwoven with the complexities of the Lovelock family; small town gossip and innuendo; the hardship of drought for the farmers of the Mallee; and the consequences of forced removal of babies from unwed mothers for adoption to "good" families. "Life was not like detective books, where the writer made everything fit in together." Someone on GR said the mystery isn't solved, but while the answers to Olive's questions aren't explicitly stated, Ackland cleverly lays out what happened to baby Asta and her big sister that day at the dam. The foreshadowing is faultless, as Olive questions her mother Audra, her aunts and uncles, her cousin Sebastian and local bad boy Jethro Sands. Olive is so busy trying to solve what she's sure was a murder, she doesn't see the facts in front of her or her hazy memories of that long ago day. "The ghosts felt very close." The tragedies that accumulate over one long, hot summer make for a difficult read. I really shouldn't have listened to the story on my drive to work - that many tears can't be safe. Miranda Nation's narration fits the story impeccably. "She was inbetween, with her childhood at the back of her and something illogical and confusing that loomed in front." I see awards in this book's future. Little Gods is the second novel from Jenny Ackland, and is quite different in form and setting to her The Secret Son. In this novel, 12-y.o. Olive is the protagonist, as she spends a summer at the family's farm, catching snippets of adult conversations ranging from the prosaic and mundane, to mysterious allusions to a 'sister'. When she discovers photos of a red-headed child, Olive becomes determined to find out what happened to her. Olive reminded me of Harriet the Spy, cruising the streets on Little Gods is the second novel from Jenny Ackland, and is quite different in form and setting to her The Secret Son. In this novel, 12-y.o. Olive is the protagonist, as she spends a summer at the family's farm, catching snippets of adult conversations ranging from the prosaic and mundane, to mysterious allusions to a 'sister'. When she discovers photos of a red-headed child, Olive becomes determined to find out what happened to her. Olive reminded me of Harriet the Spy, cruising the streets on her pushbike, binoculars swinging around her neck. People, even her cousin Seb, are reluctant to tell her the whole truth, and Olive has to piece together what she thinks happened to her baby sister Aster. When she realises her main suspect, she puts a plan in place, becoming judge, jury and executioner. The Little Gods of the title is a reference to judging others on their deeds, and not who they are. Olive's family tree is criss-crossed, with wild loops, unlike the linear forms of her classmates'. Her mother and one aunt are married to brothers. And the unmarried aunt Thistle and unmarried uncle Cleg provides her with an extraordinary vocabulary, as well as more practical life lessons. There are some beautiful words in this coming-of-age story, and though we're not meant to quote directly from ARCs, I must mention "A caged corvid will dement." and hope it remains intact in the final version. This is a book to sink into, with observations about human nature and the natural world, and meditations on 'truth'. I loved this book for its great big heart, and for wonderful Olive, and for its rich, rich atmosphere. This book took a while to get going, but once it did, it was great. I found it to be a very different book to The Secret Son, and I mean that as a good thing. I found aspects of that book pretty good and other aspects underwhelming. But this book was one of those that was a slow burn. It started off a bit iffy, and it seemed as if the different threads linking the characters was going to be difficult to discern, even down to figuring out who Olive's father was. However, I think that was a reflect This book took a while to get going, but once it did, it was great. I found it to be a very different book to The Secret Son, and I mean that as a good thing. I found aspects of that book pretty good and other aspects underwhelming. But this book was one of those that was a slow burn. It started off a bit iffy, and it seemed as if the different threads linking the characters was going to be difficult to discern, even down to figuring out who Olive's father was. However, I think that was a reflection of the main voice, that of Olive's being a child narrator, and as a result her immaturity rendered her a somewhat unreliable narrator. She saw everything, but she also saw connections where there was none or drew conclusions that were informed by what she wanted to believe. In this way, the voice of Olive was honest, sincere and realistic. Rest assured, the pieces of the story do come together. While some clever editing could probably improve this, I think it would be a mistake to do away with this aspect of the narrative altogether. Part of what made Olive an unreliable narrator were the 'secrets' that were kept from her by the adults in the story. It is clear in the book that this was done to either spare Olive pain, or more likely, to save the adults from the pain of recounting the events to Olive. But as children (and most of us adults) are apt to do, in the absence of information, they will create their own. And it is in this creation that Olive finds herself on a path that she believes will atone for losses in hers and her family's lives. Her efforts bring them to the fore in spite of attempts to ensure they remain hidden, and what Olive finds out isn't what she expected. Olive is a fiercely smart and determined little girl. Unfortunately this fierce spirit takes a bit of a beating in her attempt to uncover her family's secrets. Olive is transformed by this experience, and has a much more subdued sense of her own strength and worth. However, this is probably a universal experience, as we all have to swallow that bitter pill of not being quite as fantastic as we thought we were, and I think this is a big part of Olive's journey. Her hurt is palpable as this is her first discovery that her reasoning and her judgement are fallible. 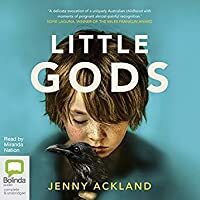 Little Gods (Allen & Unwin Books 2018) by Jenny Ackland has been on my TBR pile for a while now but was speedily moved up when it was recently longlisted for the Stella Prize. Reminiscent of Sofie Laguna’s The Choke, Little Gods features the distinct and endearing voice of Olive Lovelock, 12 years old, who is growing up in the flat scrubland country of north-western Victoria. She is an only child but spends much of her time with her aunt and uncle and her three cousins, and with her half-tam Little Gods (Allen & Unwin Books 2018) by Jenny Ackland has been on my TBR pile for a while now but was speedily moved up when it was recently longlisted for the Stella Prize. Reminiscent of Sofie Laguna’s The Choke, Little Gods features the distinct and endearing voice of Olive Lovelock, 12 years old, who is growing up in the flat scrubland country of north-western Victoria. She is an only child but spends much of her time with her aunt and uncle and her three cousins, and with her half-tame, half-wild bird, Grace. Olive’s father Bruce is silent; her mother Audra is delicate. Her aunt Rue and her uncle William are warm and welcoming. Her cousins Sebastian, Archie and little Mandy, and her best friend Peter, are her compatriots on adventures large and small. Her aunt Thistle is mysterious and knowing; she treats Olive as a grown-up, tells her things the other adults keep secret, and involves all the children in literary pantomimes and productions that seem to take a lot out of her. The book immerses us in that liminal time of tweenhood, between childhood and adolescence, when much of life is still playing games and having fun, but adult issues are beginning to become important, and the line between what is suspected or what is guessed at, and what is known for sure, becomes blurred. It is a time of baking on the hot concrete of the local pool, bike-riding for hours until the sun goes down, exploring caves and creeks, rescuing wildlife and collecting treasures. It is a time when the innocence of childhood begins to dissipate, and the responsibilities of growing older begin to intrude. Olive is feisty, intelligent, quick-witted, compassionate and brave. She has a wonderful imagination and is always up for adventure. When – by chance – she learns that she had a baby sister who died, she becomes convinced it was no accident, but murder. Her suspicions fall heavily on the Sands family, with their motley crew of five boys who always seem to be on the wrong side of the law and/or the rules of society or outside the bounds of polite behaviour. She becomes obsessed with uncovering the truth of this mystery and stops at nothing in her investigations. But as Olive discovers more and more about what went on in her family so many years earlier, she realises that knowing the truth is not always better than blissful ignorance. Received an ARC edition courtesy of Allen and Unwin. Ackland has created a wonderful set of characters - Olive and Thistle in particular - and set them in a rural Victorian 1970s that felt deeply familiar. The plot didn't always feel entirely believable to me, but the unfurling of family secrets was mostly well handled. Definitely worth a read! DNF after 100 pages. To get this far without feeling anything for the characters, having any semblance of plot... no, I’m done. Loved the idea behind this one but was incredibly disappointed with the execution. Today, I decided that the book deserves one last chance. Unbelievably, I caught on fairly quickly and finished the novel in no time at all. I guess the story did pick up after the confusing first third of the book. All the background set up is done and we can actually progress with what's happened next. It's obvious from the book's description that the mystery was a tragedy and it's something the family does not speak about. I admired Olive's persistence in finding out the truth and when it hurt (a lot of inferences need to be drawn by the readers as to what's actually happened; I was rather annoyed with this), she dealt and lived. I wanted to read this book as it supposedly echoed Seven Little Australians, Cloudstreet, & Jasper Jones. I loved these three Aussie classics but unfortunately, I can't say the same for Little Gods. Maybe, I picked it up at the wrong time and so struggled badly with the beginning of it, who knows?! Whilst I totally agree that this novel has a very Aussie vibes, I'm left dissatisfied at the close of the book. It took me a while to fully appreciate the author's style of writing but once I did, I really enjoyed reading this book. A lot of that enjoyment I guess, was because it reminded me so much of my own lazy Summer days, growing up in a small town in country Victoria. Riding my bike to the shop for a Razz or Glug and days spent soaking up the sun at the local pool. I would have loved to have a little more clarity regarding the relationship between the sisters. The author hinted at events, at times I It took me a while to fully appreciate the author's style of writing but once I did, I really enjoyed reading this book. A lot of that enjoyment I guess, was because it reminded me so much of my own lazy Summer days, growing up in a small town in country Victoria. Riding my bike to the shop for a Razz or Glug and days spent soaking up the sun at the local pool. I would have loved to have a little more clarity regarding the relationship between the sisters. The author hinted at events, at times I feel I may have missed picking up on some things that occurred due to the subtlety of the writing. I found this a little frustrating at times as I really wanted to know what was what (view spoiler)[Who was the father of Thistle's baby? Was it one of her sister's husband's? (hide spoiler)] Probably more my fault than the author's though. Thanks to Allen & Unwin for my copy. Olive is a girl in between childhood and adulthood and is coming to discover the complexities and secrets inherent in an adults life. She was a great character. As were the others around her, from cousins to friends to the adults. Each one of hem felt very real. I also loved and related to the whole aspect of growing up in Australia. As well as the references to Aussie things like Vegemite and stuff. Just something I found nice since I rarely read any Australian books. The story itself started slow Olive is a girl in between childhood and adulthood and is coming to discover the complexities and secrets inherent in an adults life. The story itself started slow, but really got going and even had a little mystery which did really pique my interest. This mystery was to do with uncovering her families secrets. Which led down an interesting path of creating her own truth when nobody else would tell her the actual truth, wether they knew it or not. The one downside was the character voice. I couldn’t quite discern at time Who was speaking the dialogue and whom Olive was talking about. Especially in scenes where many characters were present. This may have also been due to my copy being an uncorrected proof. I recommend lining up a friend to read this at the same time as you as you are likely to want to talk it over - lucky for me I had someone to have an hour-long conversation with - about plot, character, setting - everything really. For me this was very Australian - the descriptions of the bike rides and olympic pool and silos put me right back to my childhood. However, the setting could just as well be Texas or a similar dry American state, as the Australian references are fairly subtle. In fact, I recommend lining up a friend to read this at the same time as you as you are likely to want to talk it over - lucky for me I had someone to have an hour-long conversation with - about plot, character, setting - everything really. In fact, the whole book is fairly subtle, with lots of subplots and backstories hinted at but not explored - left to the reader to draw their own conclusions. I think that is a real strength in this book. Not tying up all the loose endings gives you something to mull over and think through long after you have finished reading. This was the first time in many years that I have dabbled in Australian fiction, and I found it to be a light, refreshing read, even though it could get dark in places. I appreciated the depth of the adult side characters - they each had a hidden narrative and were deeply flawed. This was gorgeously conveyed through little snippets of observation, as our young narrator had not yet developed the insight to piece them together. However, I found it difficult to follow the narrative voice. Perhaps th This was the first time in many years that I have dabbled in Australian fiction, and I found it to be a light, refreshing read, even though it could get dark in places. I appreciated the depth of the adult side characters - they each had a hidden narrative and were deeply flawed. This was gorgeously conveyed through little snippets of observation, as our young narrator had not yet developed the insight to piece them together. An interesting story of a 12 year old girl growing up in a small Australian town with her cousins. Quite a tough little girl trying to understand Adults. The story takes place over several months as Olive she tries to make sense of her complicated world, survive the end of Year Six and get through the summer before she commences High School. Olive is a child who is naively brave and eccentric and she pushes the tolerance of those around her in her attempt to understand the untruths and coverups concerning her family. She is a loner who observes her family and the people from the town and cannot comprehend what they do and sometimes she assumes too much. As Olive eavesdrops and delves into the family history, she discovers that Thistle had been pregnant and despite wanting to the keep the child, it was forcefully taken and adopted. Thistle never got over the loss of her child and continues to suffer psychologically but no one talks about it. The family members treat Thistle with soothing words and medications but in the end that is not enough for her. Olive discovers that she had a younger sister called Aster who died when Olive was about five but Olive has blacked out the memory of her and how she died and no one in the family will talk about it. On p 277 Thistle describes herself as a truthteller in a family of liars and secret makers and laments that “we can be so hurtful to each other”. Nonetheless, she is very important to young Olive and answers many of her questions, is a wonderful mentor for her enquiring mind, but her answers are often oblique and Olive is often confused. Olive blends the answers she receives from her uncle Cleg and aunt to decide that she will have to solve her dilemmas on her own. Her uncle had inferred that the legal system dealt with and punished wrong doers rightly but Thistle had impressed her with the idea that one should do everything to make things right as “in the Bible…people are little gods, which means they have power to do things like make baddies pay.” (p 300). I often give 5 stars to my reading, given the book has been well-written and sustained my interest. I love a lot of books. Then along come the 'best books' and I need more than a five star rating. Little Gods is one of those. 5*! for sure. There's a lot to love about Olive Lovelock. She's a 12 year old girl living in Serpentine on the Loddon Valley Highway, and is often out on the family farm. The story involves her determination to solve a family mystery, involving along the way her aunts, moth I often give 5 stars to my reading, given the book has been well-written and sustained my interest. I love a lot of books. Then along come the 'best books' and I need more than a five star rating. Little Gods is one of those. 5*! for sure. There's a lot to love about Olive Lovelock. She's a 12 year old girl living in Serpentine on the Loddon Valley Highway, and is often out on the family farm. The story involves her determination to solve a family mystery, involving along the way her aunts, mother, friends and enemies. We get to see the families in action, adults Vs children. The adult characters range from eccentric, practical, kindhearted, to cold, oblivious or maybe just ill-advised. It is the 1980s after all. The children, though, show more depth, developing, making mistakes, changing and learning in ways that are very familiar. We may recognise them but it's not often an author can sustain control like Jenny Ackland does. Emotions of fear, terror, confusion and grief naturally dominate a lot of fun and enjoyment among the kids. It's often funny too. Olive is truly a memorable character, she's a mix of strong, inquiring, brave and bossy. The author uses her to show a child's understanding of the world, in social terms. There's a lot going on in her head, and a lot of action going on in her story. I predict this will become a much-loved Australian novel! But I did waste 6 or 7 hours of prime reading time trying to finish it! Aaak! Do I get points for trying? The premise is good- 12yo Olive Lovelock tries to uncover the family secret about her dead sister over the course of a long hot Mallee summer. Who drowned her? How did she die? The adults in her life- mum Audra and aunts Roo and Thistle are obtuse and annoying. Their quirks are irritating, not endearing and their husbands’ (who are also brothers), equally so. This is supposedly set in the 80s but it didn’t ring very true to me. But. And here’s the big but- I listened to this as an audio book narrated by Miranda Nation and it was just all wrong. Thistle’s voice was inconsistent and annoying, and for something pegged as an Aussie gothic novel it needed someone with a deeper and more ominous voice. Her first novel, THE SECRET SON - a Ned Kelly/Gallipoli mash-up about truth, identity and the foibles of history - was Jenny Ackland is a writer and teacher from Melbourne. She is the recipient of a Creative Victoria VicArts Grant, a Bundanon Residency Fellowship and a Varuna Residency Fellowship.